PIERRE, S.D. – Two lacquer radio transcription discs, held in the collections of the South Dakota State Historical Society-Archives at the Cultural Heritage Center in Pierre, broadcast the June 7, 1941, double christening and launching of the battleship USS South Dakota from the New York Shipbuilding Corporation ways at Camden, N.J. The digital audio recording of the christening of the South Dakota can be heard on the South Dakota Digital Archives website. Visit history.sd.gov/archives and find the link on the right to “USS South Dakota.” A transcript of the recording is also available on the website. The audio recording run time is just over 21 minutes. The two discs were recently sent to the Northeast Document Conservation Center in Andover, Mass. The conservation center used its touchless optical scanning technology, called IRENE, to retrieve the sound from the two discs. 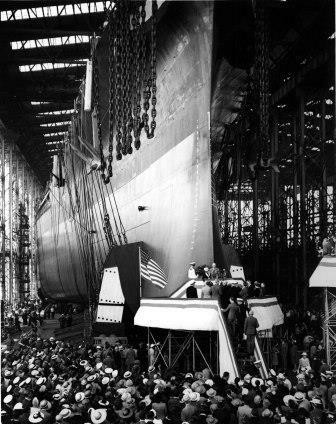 At 1:20 p.m., on June 7, 1941, First Lady Vera Bushfield, official sponsor of the battleship christening ceremonies and wife of South Dakota Governor Harlan J. Bushfield, christened the battleship with a “full-size” bottle of Cook’s Imperial American champagne across the waiting prow of the United States Navy’s newest battleship South Dakota. A second “half-sized” champagne bottle, donated by Pierre resident Genevieve Trask, was also used in the ceremony – a special double christening. The Sioux Falls Washington High School band performed at the event and played “Anchors Aweigh” as the ship drifted into the Delaware River. The band played the national anthem later in the ceremony. A recording of the ceremony was made by radio station WCAU of Philadelphia. The recording was sent via airmail to WNAX in Yankton, which broadcast the ceremonies. Arthur J. Smith, program director of WNAX, presented the transcription discs to Governor and Mrs. Bushfield, who then transferred them to the South Dakota State Historical Society. The 17th Virginia Class nuclear submarine, the USS SOUTH DAKOTA (SSN 790), will be christened in the summer of 2017. The submarine is scheduled to join the fleet in August 2018. The SSN 790 will be the third boat commissioned with the name “South Dakota.” The first was the Armored Cruiser USS South Dakota (ACR-9). The second was the Battleship South Dakota (BB-57), one of the most decorated battleships in World War II.